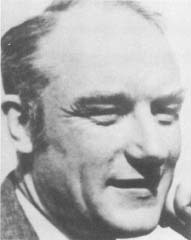 Francis Harry Compton Crick (1916-) worked closely with James Dewey Watson (1928-) to work out the structure of the deoxyribonucleic acid (DNA) molecule. This research was very important because it showed that DNA was the true carrier of genetic instructions in cells. Crick was born in 1916 in Northampton, England. After graduating with a degree in physics from University College (London), he developed radar systems and magnetic mines for the British military during World War II (1939-1945). In 1947, he worked at Strangeways Research Laboratory by day and studied biology in the evenings. Crick later moved to the Cavendish Laboratory at Cambridge University. It was there that he first met Watson and began work on the structure of DNA. Although Watson had to initially persuade him to take up the DNA project, it was not long before Crick became an enthusiastic participant. For their DNA studies, Crick and Watson—along with Maurice Hugh Frederick Wilkins (1916-)—were awarded the Nobel Prize in 1963. In 1977 Crick's distinguished status in the scientific community earned him a professorship at the famous Salk Institute for Biological Studies in San Diego, California. He continues to lead an active role in several areas of ongoing research today, particularly the nature of consciousness and the workings of the brain.